The opening credits are a harbinger of doom, the smokestacks of an Italian factory wasteland, gray and out of focus, suggesting an existence of labor so menial no one can quite see its point. Even when they do finally come into view, they don’t really, emitting strange noises and plumes of smoke that look an awful lot like the fog rolling in off the nearby sea, as if you can be lost at sea on land. What these factories produce and what its denizens of enterprise do is never explicated. Why would it be? It’s entirely beside the point. There’s a scene in which a young boy’s toy robot repeatedly smashes against a wall and it the context of a film that hurls metaphors around with wondrous abandon, it’s hard not to view that robot as the whole lot of us, programmed automatons, helplessly banging our heads against the wall, unaware of an alternative to these same old existences. The plant is overseen by Ugo (Carlo Chionetti) who is married to Giuliana (Monica Vitti). The first time we see her she is wandering in the midst of this ashen landscape, her bright green coat standing in stark contrast to the bleakness all around, barely cognizant of her young son’s presence, more or less confronting some nameless man and demanding his sandwich. She scarfs it down with abandon. Eating has never seemed so eerie. It’s not that she can’t afford to eat; she gives him money for it! It’s as if she requires sustenance of any kind in the face of such mammoth technological meaningless. Giuliana’s mental state exists on a slippery slope. She has recently been in a car accident that Ugo assumes has left her a little loopy. Eventually, however, we learn the truth; Giuliana was trying to commit suicide. She was trying to leave this sterile existence behind. She admits this to Corrado (Richard Harris), a friend of Ugo. Corrado is dashing and clearly enamored with Giuliana. She seems at least partially enamored with him. This is a set-up for a tumultuous, tempestuous affair, yet “Red Desert” is never much interested in charting that path, just as it’s never much interested in charting any narrative path. She is drawn to Carrado not so much sexually as for the simple reason that he represents something else. In that way, he’s no different than the shop she wants to open in town, the shop that will sell a product she hasn’t even chosen because it probably wouldn’t even matter if she did. In that way, he’s no different than so many images of ships setting out to sea, at which Giuliana stares longingly, like she’s a mariner who’s been landlocked all this time and wants to put out from port. Though it came thirty-one years before, “Red Desert” evokes “Safe”, the Todd Haynes film in which Julianne Moore played a woman who was seemingly, unexplained, poisoned by the environment all around her, left in a state so weakened she can barely exist. The same thing is happening to Giuliana. Of course, she’s Italian and her disconnect from reality is more histrionic. The results, however, are not dissimilar, a woman tracking toward a symbolically ruinous end. Certainly the idea of society’s infection is raised. At some strange party in a fishing house along the coast a giant tanker of a ship docked just outside the window raises a polio flag. The party guests hustle to safety. Yet back in the cozy confines of their home it seems as Giuliana’s son has developed polio; until the polio vanishes; unless the polio was just a figment of his imagination or of Giuliana’s. It’s hard to say, frankly, and it’s hard to say whether her apparent crisis is born of something truly physical or just emotional. 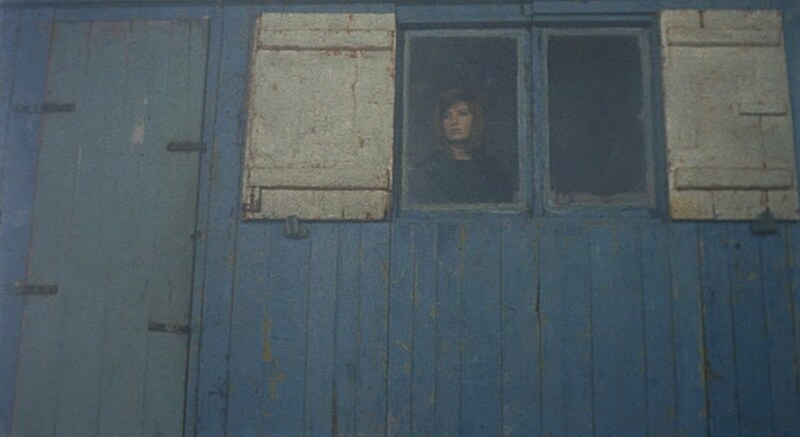 Like so much else, Antonioni has no interest in specifics. 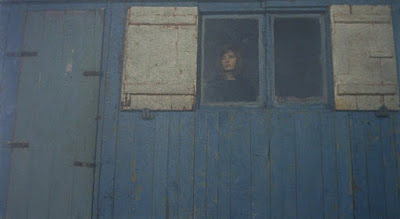 The whole film is more like a mood, a perilous state of mind. That’s why it hinges on a dreamscape. In caring for her son, Giuliana is stirred to recite a fable, one about a young girl living alone on a pink-beached island. It’s like something out of a Terrence Malick film, the Eden that Pvt. Witt finds in “The Thin Red Line”, but whereas that Eden was real, the Eden of “Red Desert” is illusory, a fantasyland where a person does not stand apart from the place they inhabit but becomes a part of it, melded together. 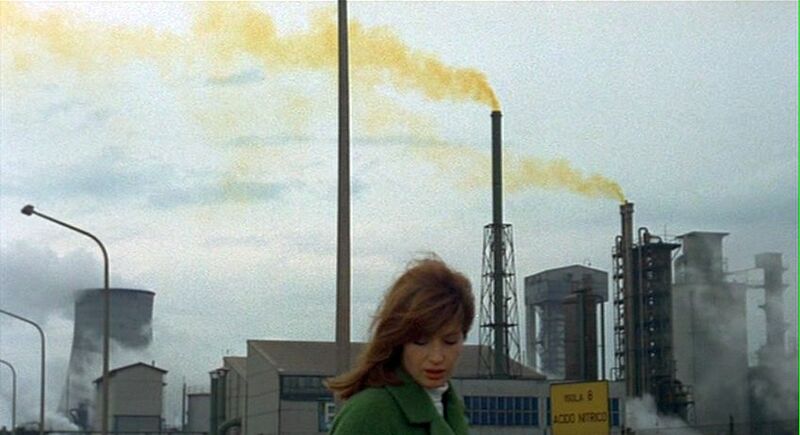 In the real world, Giuliana stands apart from her landscape, crystallized in the concluding sequence (still sporting the striking green coat that makes her stand out in a sea of blah) where a flock of birds deliberately avoids the toxic smoke emitted by the dour factories. You either evade the societal poison while watching in horror what it does to everyone else or you shrug, walk straight into it and breathe those fumes in.